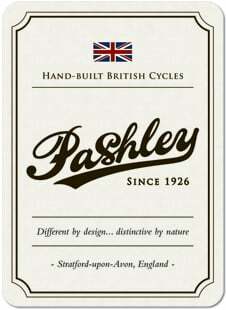 Pashley is England’s longest established manufacturer of hand-built bicycles. Every Pashley cycle is hand-crafted in the town of Stratford-upon-Avon (the birthplace of William Shakespeare), situated on the edge of the Cotswolds. The company has survived, since its inception in 1926, as a pure British manufacturer – it has never taken its production base overseas; a fact those at Pashley are very proud of. We maintain our small company roots remaining privately owned and a family business, with a small management team and a longstanding and loyal workforce, many of whom have spent their lifetime involved within British manufacturing (our longest serving employee has been with Pashley for over forty five years). Our cycles are traditionally hand-built by our dedicated team of skilled brazers and assemblers, who use traditional methods to create work of the highest standard. Steel tubes are hand-brazed into lugs, giving them fewer in-built stresses and heat-affected zones, and an attention to detail that only a frame crafted by hand can possess. We employ a workforce who take great pride in creating cycles here in England, and when sourcing components, our policy is to work with other British companies where we can indirectly support the employment and skill retention of other UK workforces. If we are unable to make a component in-house, we will always try first to source locally in the Midlands, and then nationally in the UK, after which we will look to Europe and the Far East. With a heritage spanning back to 1882, the Brooks saddle continues to be the ‘Rolls-Royce’ of saddles. Made from the finest materials, their designs form to your shape over time becoming uniquely yours, and with many featuring additional 'bump' absorbing springs, they offer a supremely comfortable ride. Brooks remains one of Pashley's closest UK manufacturing allies; with a saddle that is hand-made up the road from us in Birmingham and built to last for many years of loyal service, they are a perfect fit for a Pashley. The original British ‘standard of excellence’ in frame building, Reynolds tubing is used for many of our cycle frames for its high-strength yet lightweight qualities. Although steel is sometimes regarded as ‘old-fashioned’, it is actually an excellent material for building bicycle frames. High tensile steel has a far greater ultimate strength and stiffness value than aluminium or titanium alloy. Steel responds well in fatigue conditions, and is able to withstand the repeated stress typically placed on a bicycle frame. Specifically, a steel cycle frame can impart a better ‘feel’ and ride comfort than its aluminium or titanium alloy equivalent. Although manufacture has now moved overseas from Nottingham, Sturmey remains the original British-designed hub gearing system, first patented in 1902 by Henry Sturmey. The majority of Pashley Cycles continue to be fitted with the latest versions of these enclosed hub gears, which have proven record for reliability and low-maintenance in all-weathers (particularly British weather! ).